Sorry... the 2017 Volkswagen Tiguan is no longer being sold as new. Instead, take the first step to a great deal on 2019 Volkswagen Tiguan with a free price quote! The 2017 Volkswagen Tiguan is a compact SUV that seats up to 5 passengers. It competes with the Ford Escape, Mazda CX-5, and Toyota RAV4. This year, it has removed the R-Line and SE trim levels, but adds new Wolfsburg and Sport trims. Four trims are available: the S, Wolfsburg, Sport, and SEL. 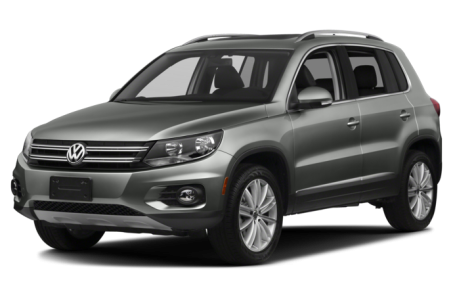 The Tiguan has a bulbous front-end with an outstretched grille and wing-shaped headlights. The wheel wells are squared-off for a more rugged-look. The underbody trim is clad in black, and protrudes out at the rear. Heated side mirrors with turn signal indicators and 16-inch alloy wheels come standard. Bi-Xenon headlights, LED daytime running lights, power-folding side mirrors, a panoramic moonroof, a rear spoiler, and larger 17-, 18-, or 19-inch alloy wheels are available as well. Under the hood, the Tiguan is powered by a standard 200-hp, turbocharged 2.0-liter 4-cylinder engine mated to a 6-speed automatic transmission. Front-wheel drive comes standard, while all-wheel drive is optional. The Sport and SEL trims come with sport-tuned suspension as well. Fuel efficiency for the Tiguan is an EPA-estimated 20/24 mpg city/highway. Inside, the Tiguan has a standard V-Tex leatherette interior with a flat-folding front passenger seat and a 40/20/40 split-folding rear seat. Maximum cargo capacity is 56.1 cubic feet with the rear seat folded down. The center stack features the standard Composition Media system with a 6.3-inch touchscreen, Apple CarPlay/Android Auto compatibility, Bluetooth connectivity for phone and audio, and a USB port. It can be upgraded to the Discover Media unit with an integrated navigation system and a Fender premium audio system. Standard features include automatic climate control, heated front seats, a leather-wrap steering wheel, remote keyless entry, and push-button start. Leather upholstery, dual-zone automatic climate control, and a power driver’s seat are also available. Standard safety features include a backup camera, a tire pressure monitoring system, and Volkswagen’s Intelligent Crash Response System that shuts off the fuel pump, unlocks the doors, and switches on the hazard warning lights if the airbags deploy. 29 of 30 (96%) consumers said they would recommend this vehicle to a friend.